Secrets of the Dead: The Mona Lisa Mystery is a Terra Mater Factual Studios Production in association with THIRTEEN Productions LLC for WNET. Writers are Martin Mészáros and Klaus T. Steindl. Director is Klaus T. Steindl. Narrator is Jay O. Sanders. Executive producers for Terra Mater are Sabine Holzer and Martin Mészáros. Executive in charge for WNET is Stephen Segaller. Executive producer for WNET is Steve Burns. Coordinating producer for WNET is Stephanie Carter. THIS PROGRAM WAS PRODUCED BY TERRA MATER AND THIRTEEN, WHICH ARE SOLELY RESPONSIBLE FOR ITS CONTENT. She is the most famous work of art in the world. Her name synonymous with intrigue. Her expression guards a secret five centuries old. Wie see a face which is just about to smile. It’s almost a philosphical picture. It’s a demonstration of what painting can do. The Mona Lisa wasn’t always a celebrity. She didn’t steal the spotlight until she was stolen, herself. Vanished, hidden away for more than two years. In her absence, a second Mona Lisa appeared. She looked younger and fresher. Had Leonardo da Vinci painted the world’s most famous portrait…twice? Evidence suggests Leonardo worked on the Mona Lisa at two different periods in his life – more than a decade apart. Is this the missing link, an early study for the legendary portrait? Is it a copy from Leonardo’s studio? Or a most cunning forgery? ... and finally solve the mystery of the Mona Lisa. At the Louvre museum in Paris, a small portrait - the Mona Lisa - hangs in a Renaissance gallery. Until now, she’s been a work of little renown. But she’s about to become a sensation. After the museum locks its doors, a handyman, Vincenzo Peruggia, climbs out of hiding and pries the portrait from its frame. He knows the layout of the gallery well - he was recently hired to do renovation work at the Louvre. Peruggia carefully wraps the priceless wooden panel in a cloth. The next morning, in broad daylight, he walks out of the Louvre…with the Mona Lisa tucked under his arm. An entire day passes before anyone notices the masterpiece is missing. Then, she hits the headlines. Until the heist, Leonardo da Vinci‘s portrait was known mainly to art experts. Almost overnight, the Mona Lisa became a household name. The scandal had made her a superstar. The police interrogate a number of suspects, but fail to zero in on the handyman. The Mona Lisa had vanished. No one knew if she would ever be seen again. Around the time of her disappearance, an art dealer was traveling through England in search of rare objects. He claimed that while visiting an estate in Somerset, someone made him an intriguing offer. The owner claimed a relative had returned from a grand tour of Italy, bringing a mysterious painting back with him. It was a most remarkable portrait. At first sight it looked like the Mona Lisa. But something about it was different. It seemed to be the same woman as in the famous portrait. But she seemed more youthful. And she had been painted with a familiar perfection. Could she have been created by Leonardo da Vinci himself? In 1913, the Mona Lisa once again made headlines when the now famous portrait was returned to the Louvre. The thief had hidden the painting for more than two years and was only caught while trying to sell it in Florence. In England, the art dealer Hugh Blaker allegedly bought the portrait he was offered – the so-called Isleworth Mona Lisa. He wanted to know more about his mysterious acquisition. Could there actually be two Mona Lisas? On the basis of the knowledge we have today, there are two theories: The traditional theory that says there is just a single portrait of the Mona Lisa and that is in the Louvre. The other suggests that there are two completely different paintings in existence. Rumors of a second Mona Lisa had just begun to circulate, sparked by newly discovered records describing a different version of the painting. As an art dealer, Blaker was likely aware of the theory. Could he now be the proud owner of this fabled other Mona Lisa? They mystery of the Mona Lisa begins in Italy during the cultural explosion of the 15th and 16th centuries: the Renaissance. Leonardo’s every act was driven by an insatiable scientific curiosity. Leonardo described himself once as a “discepolo d’esperienzia” which can either be translated as a disciple of experience or as a disciple of experiment. Throughout his life Leonardo was a relentless, tough-minded experimenter. It was in a sense his creed, his belief in the importance of questioning, of searching, of investigating and experimenting. Leonardo approached every challenge – in technology or the arts –with an unparalleled hunger for invention. He wants the picture to be a total remaking of the natural world. He wants everything to be in there: He wants movement, he wants life, he wants optics, he wants anatomy, he wants geology, he wants botany. And in a sense that’s more than a moving film could do these days. So, in way it’s an impossible agenda, he’s setting a standard for a picture which no one, not even Leonardo, could possibly meet. In 1503, the man of complex talents took on a surprisingly simple commission. Keeping up with the nobility in Florence, one of the richest and most powerful city-states in Italy, was not always easy for Leonardo. Leonardo’s relationship with Florence was kind of a troubled relationship. Florence was associated with a world which he might have wanted to join but felt excluded from, partly from his illegitimacy, partly for temperamental reasons. He honed his craft and his skill here but he never quite felt at home. He’s even described at one point as being unpatient with the paintbrush, he doesn’t wish to pick up the paint brush because he is pursuing so many other ideas. Ideas can be slow to fill the coffers, and for Leonardo, the paintbrush was a trusted source of revenue. Leonardo’s usual patrons were princes and high-ranking clerics – people in the public eye. Now he was being asked to paint a portrait of a relative unknown - a silk merchant’s wife. Clues to the curious commission can be found in the library of one of the most renowned art collections in the world, the Uffizi Gallery in Florence. The library holds the first edition of a seminal work on art from the Italian Renaissance: Lives of the Most Excellent Italian Painters, Sculptors and Architects by Giorgio Vasari. Published in 1550, it’s considered the preeminent source of information on Renaissance art. Vasari wrote the manuscript after Leonardo’s death, but with full access to the artist’s records and eyewitnesses. Vasari writes of a silk merchant named Francesco del Giocondo, whose sons confirmed that Leonardo da Vinci painted a portrait of their mother. Her name: Lisa, Mona Lisa - Monna is an archaic Italian word for lady. In his description, it is the note about the eyelashes that is critical. He describes them as a wonderful distinctive feature of the painting. But is Vasari describing the picture now hanging in the Louvre behind bulletproof glass? In this portrait, there is no trace of the eyelashes, lips and eyebrows that so delighted the Renaissance writer. If we look at the Mona Lisa in the Louvre we can see that these eyelashes do not exist. This raises doubts: Was Vasari familiar with the painting in the Louvre? Or are there two different works in existence? If Vasari was describing the painting in the Louvre…where are the lashes and brows? New photo technology can peel back the layers of history hidden behind coats of paint. French technician Pascal Cotte uses these cutting edge cameras to try to solve the mystery of the missing eyebrows. A high-resolution sensor records a series of images at different wavelengths of light. I found the eyebrows with only three filters and only in the visible range. We don’t need the infrared range to find it, because this is very thin and this is very close to the surface of the painting. There is no clear scientific answer how the eyebrows disappeared. We can only make the supposition that someone cleaning the varnish on top of Mona Lisa removed the eyebrows because the eyebrows were painted inside the varnish. What little remains doesn't seem to justify Vasari’s effusive account. It could be he had seen a different version of the Mona Lisa. Legendary paintings like the Mona Lisa have often been transformed through a murky history of repairs and restoration. I find myself going to many museums and studying – obviously – hundreds of works of art in museum environments. And the visitors, they don’t realise that most of the time they are looking at a surface that is far from being the original one. The original one meaning how much has changed, how much material has been added, how much has decayed and how much (of) what you see is the result of several restorations as well as several cleaning jobs. The restorer Ernst Lux has saved many masterpieces from decay. He knows well how the preservation techniques of past centuries could damage a work of art. You have to imagine in those times how cleaning had been done. There was a mixture, normally, of turpentine, alcohol and ammonia, maybe added some lavender oil or …whatever … half onions. And all these substances have one thing in common: they are extremely aggressive. So this could still be the Mona Lisa Vasari described…the fine lashes and eyebrows scrubbed away by centuries of harsh restoration. Is it possible he was describing the Isleworth Mona Lisa – the version Hugh Blaker bought in England? Today, the Isleworth Mona Lisa is kept in a secret location in Switzerland, locked away in an armored safe. The portrait has changed hands several times since its discovery. In 2008, it was acquired by a group of international investors. The identity of the buyers and the price they paid for the painting is a closely guarded secret. Aside from the eyebrows and lashes, another feature of the Isleworth Mona Lisa aligns with Vasari’s description: the background remains unfinished. The landscape behind the figure is almost completely missing. Even unfinished, it could still be Leonardo’s work. Its incomplete state would be typical of a busy artist of his caliber. Leonardos restless mind, his restless interest in the world around him, in new trains of thought, new areas of study, new paintings to undertake, seems to make him a man who is always discarding and abandoning and moving on from paintings and leaving them unfinished. In 1503, Leonardo was awarded a major commission - the most prestigious assignment in Florence. That same year he began work on the Mona Lisa. Leonardo was chosen to commemorate a famous battle on the walls of the Palazzo Vecchio, Florence’s center of power. The Battle of Anghiari was a decisive moment in the city’s history. For the heroic mural, Leonardo devised a new, untested technique. But for once, his ingenuity backfired: The hot wax colors took too long to dry, failed to adhere, and began to drip down the walls. It was the most ambitious assignment the proud city of Florence had to offer – and Leonardo had failed. Halfway through the job, Leonardo threw in the towel, leaving the unfinished fresco behind. There is nothing left of it today. It was not the first time he had abandoned a commission. Several of his most famous works remain incomplete. I think Leonardo is the sort of artist who in a sense never thought pictures were finished. (…) He could always see additional possibilities. He could always see something that seemed to him a bit better. So he never settled in that way. It’s possible Leonardo also lost interest halfway through painting Lisa, the wife of the silk merchant. Could he have grown weary of the face that now enchants millions of visitors to the Louvre every year? If so, could the unfinished portrait still exist as a second version -- the Isleworth Mona Lisa? Comparing the portraits, the two women are clearly the same person. But in the unfinished version, she seems slightly younger. Could this be a clue as to when she was painted? At the University of Heidelberg in Germany, a piece of evidence regarding the timing of the painting recently came to light. Experts carrying out restoration work at the library stumbled across a handwritten note in the margin of a 16th century book. One early owner of this book was Agostino Vespucci. Vespucci was personally acquainted with Leonardo and we can assume that he had access to Leonardo’s studio, that he had seen his pictures. And that after his visit, he had made the handwritten note in his book. He wrote that while Leonardo usually completes the head and upper bodies of his subjects, he often leaves the rest of the painting unfinished and cites the portrait of Lisa del Giocondo as an example – and then dates it October 1503. In October of 1503, the portrait had not been finished. At that time, Lisa del Giacondo was a young woman of 24. Her husband hired Leonardo to paint her portrait while she was expecting her second child. Although she would one day be celebrated as Leonardo’s most beguiling muse, it’s likely she spent very little time with the master, himself. The artist would have made a sketch, would have made a likeness of some sort and that probably was about the end of it. The sitter wouldn’t be there. This idea of the sitter who sits in a chair, the artist sits there and you sit there while he spends ages and ages making the portrait – that wouldn’t happen at all. For Leonardo, the style of the painting is a departure from the grand scale of his usual work – imperious political portraits and somber religious scenes. She’s a bourgeois Florentine lady and this is an intimate portrait. It’s not a great public portrait. This woman smiling, looking at you … it’s very intimate. We see a face which is just about to smile. And so the painting contains the future moment in which Lisa del Giocondo will break into that smile. But she hasn’t done quite yet. Mona Lisa herself is a young woman just on the brink of changing because she is now a mother, she’s fleshing out, she’s a beautiful young woman who is going through physical and personal changes because she’s now a young mother, a young wife. A portrait by Leonardo would surely have been a major expense for the family. But no record of the commission exists. The question of why continues to puzzle historians like Giuseppe Pallanti. I have conducted extensive research in the archives in Florence, including the Archivio degli Innocenti, a jewel among historical archives in Florence. But I have found no documentary evidence of a contract between Franceso del Giocondo and Leonardo. Florence’s highly developed tax system meant citizens were required to submit detailed records of all income and expenses. Financial transactions and assets were meticulously archived – a rich resource for historians. The document that all art historians have been looking for would prove that the portrait had been paid for. But unfortunately, there is not a single piece of evidence to suggest that Francesco del Giocondo made any payment to Leonardo. From 1503 to 1506 –when Leonardo lived in Florence - there is no record of the Giacondo family spending any money at all on a painting. Perhaps they never received the finished portrait. Why had Leonardo not delivered the painting? There is no logical explanation. It was in Leonardo’s interest to hand over the painting and receive his fee. And Francesco would also have had an interest in owning a picture painted by the most famous painter of the age. There is no rational reason why Leonardo should have painted the picture and then kept it for himself. It could be that the portrait wasn’t finished, and Leonardo never collected his fee. …possibly for the rest of his life. Leonardo spent his final years in France at the invitation of King Francis I. He lived in a small chateau in the Loire valley until 1517, when he died and was buried in the local chapel. Two years before his death, an important guest would leave a tantalizing clue. The visitor’s name: Cardinal Luigi d’Aragona. He arrived with his private secretary Antonio de Beatis. de Beatis recounted the Cardinal’s visit in a detailed diary. The aging Leonardo showed the Cardinal several of his works. Nearly 400 years later, in 1905, the diaries were published. They set off a storm of speculation about Leonardo’s most famous work. This contradicts accounts that Leonardo had been hired by Lisa’s husband, the silk merchant Francesco del Giocondo. The two documents by Vasari and de Beatis differ with regard to the dates and chronology of events. They provide no clear answer. But it is self-evident that Franceso del Giocondo and Giuliano de’ Medici cannot both be the client. This supports the theory of two different portraits. For both accounts to be accurate, there would have to be two versions of the portrait: the completed masterpiece, painted for Giuliano de Medici…and an unfinished version from 1503, commissioned by Lisa’s husband. Had he perhaps not “discovered” it at all? Could he have painted it himself? Or commissioned a talented forger to recreate the unfinished portrait? Leonardo is probably the most copied artist of his generation. And it goes through the 16th century, they keep making versions and copies and so on. It clearly was a famous look. People liked pictures that said Leonardo to them. Hundreds of copies of the Mona Lisa circulate throughout the world– from different periods and of varying quality. It’s possible the Isleworth Mona Lisa is one of them. ...one that had never been finished, as the Renaissance writer Vasari described. The timing of her discovery is also dubious; The Isleworth Mona Lisa appeared just after the original was looted from the Louvre, a time when a forger could be tempted to cash in on her absence. So, is the Isleworth Mona Lisa simply a fake? When I make an examination of a painting, after the first view of the main side, I just turn it over and look at the back side because I can see a lot of information of the history of this painting on the back side also. You have all the dirt of the centuries, you have inscription, you have collector numbers, you have maybe seals, stamps, whatever. The back side is normally a much more unchanged part of the history of the painting than the front side. The back of the Isleworth remains hidden from scrutiny - it was glued on top of a second canvas in the early twentieth century. For Ernst Lux, this alone is suspicious. If you want to produce a forgery this re-lining saves you a lot of work because you don’t have to imitate the back side of the painting with the dust, inscription, with the history. In many cases the faking of the back side is much more difficult than to fake the front side of the painting. Perhaps a brilliant counterfeiter had thought of nearly everything. But he could never have anticipated the technology to come. At the Swiss Federal Institute of Technology in Zurich, experts use carbon dating to authenticate ancient objects. By measuring the carbon 14 in organic material, they can determine its age. Since canvas is woven from plant fibers, a painting makes a perfect subject for the test. The challenge lies in sampling only the painting itself – not an easy task when the canvas has been relined and glued to a second layer. We need to take the sample only from the original canvas which gives the right age. If you mix it with the glue and with the other canvas we get wrong results. And it’s very difficult to purify this material, so that we extract and isolate the original fibres. Aside from being unfinished, the background of the Isleworth Mona Lisa features another key difference from her counterpart. In the Isleworth, she is flanked by two pillars, while in the Louvre Mona Lisa, the bases of the columns can just barely be seen. Why would a counterfeiter have added these columns? Around 1504, the young talent had just moved to Florence and is said to have paid a visit to Leonardo’s studio. It was probably during the visit that he drew a highly informative sketch of one of Leonardo’s works. There is a very nice pen-and-ink-drawing of a woman sitting with a balcony with columns down the side which clearly is a kind of revision of the Mona Lisa on his own behalf. What the drawing doesn’t reveal is whether the painting was finished. So there was obviously enough to see that the basic composition was there, the figure, the pose, even the columns and so on. They were certainly known in Florence and Raffael would have known that before 1507, 1508 when he left Florence. Which painting, which columns, had Raphael seen? The mystery persisted until 2004 when restorers at the Louvre removed the frame from the Mona Lisa…and discovered the painting had never been trimmed. There were never any columns in the portrait. The revelation means any version of the Mona Lisa with visible columns is most likely a fake, based on a false idea. But what of Raphael’s drawing? A comparison of his sketch with the Isleworth Mona Lisa reveals that the columns are strikingly similar. Does this mean Raphael had seen the Isleworth Mona Lisa in Leonardo’s studio, making it an early version of the famous portrait? Or is it a later forgery, based on the now debunked myth that at some stage the columns had been cut off? Determining when she was painted proves more challenging than expected. Her exact age eludes even the experts in Zurich. In general the time range between the end of the 15th century and the middle of the 17th century is a little bit difficult because the C14 concentration in the atmosphere has changed a lot. And this makes it very difficult to get precise dates during this time range. The analysis reveals that the canvas of the Isleworth Mona Lisa was probably manufactured between 1500 und 1650. It could have been made during Leonardo‘s lifetime. The results which we have now fit the characteristics of a canvas originating from the end of the 15th century or the beginning of the 16th century. The age of the canvas fits the timeline, but whose hand applied the paint? Does the painting itself hide clues that could trace it to Leonardo? Beneath him there is a hierarchy of assistants, pupils and junior “garzoni” as they are called, or lads that are helping. And each has their part. Leonardo’s assistants were often skilled artists themselves. Leonardo devised the concepts and rendered the main features of a painting, but for the background and tiresome details, he was happy to pass the paintbrush to an apprentice. Obviously the style, the idea, the creativity of the subject … we tend to believe that as the main work of the master. But the execution per se … to think that only the master would paint, that’s an illusion. The production of art in the Renaissance was based on division of labour. A flourishing studio like Leonardo‘s would otherwise be unable to keep up with demand. This also freed up time for Leonardo to get creative in other ways. The Mona Lisa certainly bears witness - or contains the evidence - of Leonardos experimentation with different techniques and with different actual physical paint and varnish and glazes as the years went by. Of course painters had their own recipes for making paint. It wasn’t just a question of going down to the shop and buying a series of bottles or tins of paint. You mixed your own paints using particular pigments, using particular bases, using particular mixes of oil and varnish and types of oil. Today, this artistic alchemy can reveal the hallmark of a painting’s creator. To find it, researchers take microscopic samples of the pigment. Will paint from the Isleworth Mona Lisa expose her creator as a fraud? The samples are cast in resin and examined under a microscope, revealing the structure of the painting – how the pigments were mixed and layered. The key is to determine whether the paint’s “recipe” is consistent with mixtures used during Leonardo’s day. Any pigments invented after his death would expose the portrait as a fake. The tests reveal that no modern materials were used in the Isleworth. It seems to have been created while Leonardo was alive. If we analyse the pigments, all the pigments are OK, the carbon dating is OK, the varnish is OK, the binder is OK, so technically everything is OK. But was the portrait painted by the master himself? Or if not by Leonardo, by someone very close to him? One of his students, nicknamed Salai, was more than just a pupil. Salai was – also according to contemporary evidence and certainly according to our own suppositions now – Leonardo’s lover, Leonardo's confidant, friend, right-hand man and bedmate. Vasari says it in a rather roundabout way but makes it pretty clear that Leonardo loved Salai. It’s possible that Leonardo‘s young lover, himself a talented artist, began a copy of his mentor’s Mona Lisa. So, to say that there are two, or more than two, that there are several versions of the Mona Lisa is not same as saying Leonardo himself painted two entirely separate paintings, one in 1503, the other much later. My own view is that the other Mona Lisas, that is to say the ones that aren’t the one sitting in the Louvre, are studio productions. If Salai copied the Mona Lisa in Leonardo’s studio, it’s possible he wasn’t the only one. At the Prado Museum in Madrid, another copy of the Mona Lisa was recently found to show corrections to the head, shoulder and fingers – identical to corrections found on the version in the Louvre. Someone had altered the copy at the same time as the original. The making of copies in studios or versions of pictures was very common if you look at the great artists of the time. Most of them would have studios. And smaller scale picture, things like madonnas, would be produced in some numbers and the pupils would assist in that. And Leonardo wasn’t different in that respect. It was clearly a way of producing small scale, Leonardo-brand pictures. Leonardo himself also says you should have three types of picture. You should have the top-quality ones which we may think of as the Mona Lisa for instance, you would have the middle-quality ones, perhaps the Madonna of the Yarnwinder, a small scale Madonna produced by Leonardo and studio. And then you had other ones which were OK, but these were basically studio products. So there is good evidence to think that Leonardo had grades of pictures. But is the evidence strong enough to say the Isleworth came from Leonardo’s studio? … the Virgin of the Rocks. Unlike the Isleworth, they are all painted on wood. Why would he make a canvas version of a painting on wood? The Vatican library holds a valuable collection of Leonardo’s writing called the Codex Urbinas. In this “Treatise on Painting,” Leonardo devotes an entire chapter to techniques for working with canvas. He clearly researched and possibly tried his hand at painting on canvas. Could the Isleworth Mona Lisa be the result of one of these experiments? An x-ray of the painting offers a clue. If you look at x-rays of paintings by Leonardo or his contemporaries they all have a blurry appearance. This is caused by the lead-white in the preparation layer and this lead-white blocks the x-rays. (…) If you look at the x-ray of the Isleworth Mona Lisa you see a very clear image. And this shows that there is more or less no lead-white in the preparation layer. Leonardo and his contemporaries more or less always used lead-white in the preparation. In his treatise at the Vatican library, Leonardo describes in detail how to prepare a canvas for painting – but never once mentions the use of lead-white. The omission is peculiar, but perhaps not for a man who was always on the edge of innovation. What scientific examination is telling us about Leonardos technique is it’s very variable. It’s almost as if he tackles each picture on a new basis. When painting on wood, a base-layer of lead-white brightens and enhances the colours. It’s essential for achieving the three-dimensional effect Leonardo realized with the Mona Lisa. But his mastery of mixing and applying the colours was an art form in itself. What we do see though is his ability to control oil glazes, these very thin layers of colour and to lay them on top of each other in a way which is not disastrous. Because if you lay drying pigment on top of pigment which isn’t dry you get all sorts of trouble. Leonardo’s technique relied on the perfect preparation of quality paints. All pigments in his studio had to comply with his exacting standards. Not every colour made the cut. Leonardo’s distinct use of colour could have left clues hidden in his work…an artistic signature that could accurately trace a painting to the master. One man is convinced he can find it. At the University of California in San Diego, Research Physicist John Asmus is one of the few people in the world to examine both Mona Lisas. He believes he can identify the hand of a genius by comparing the statistical characteristics of colour and brightness. When a forger does a copy or a copyist does a copy something of that copyist’s technique finds its way into the painting and a casual observer says: These two paintings are the same. But if you look at the statistics and the numerical variations on these statistics you ‘ll always find differences. 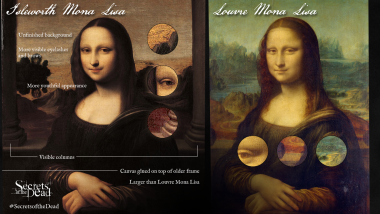 So we digitized both of the Mona Lisas and we compared the statistics of the pixels, their intensity, their standard deviation, their distribution, and we thought that this might be a way of scientifically validating what connoisseurs see when they look at these two paintings. Analyzing the scans pixel-by-pixel, Asmus compares the flow of light and color, right down to the individual brushstroke. Even he is stunned by the results. We found that the histograms of the two Mona Lisa are virtually identical. You could switch them in front of me and I couldn’t tell which was which. If you look at the statistics of this I would say that it’s 99 percent certain that the two Mona Lisas were done by the same artist. If the results are correct, they raise a critical question: Why would Leonardo da Vinci have painted the same subject twice? The answer might be found in Rome, where late in life Leonardo perfected his technique. We don’t really fully know what he was experimenting on in the Belvedere in Rome. But it seems to be some idea of – as he put it in one note – capturing sunlight. And this probably contributed much to his dubious reputation in Rome as something approaching some sort of magician or a shaman. Many experts believe Leonardo‘s superb handling of light, colour and shadow reached the peak of perfection in his final work, a picture of St. John the Baptist. It was most likely commissioned by Pope Leo X. Leonardo’s companion Salai is thought to have served as the model for the saint. Today, the picture hangs in the Louvre alongside two other works: the Virgin and Child with St. Anne, from the same period, and the Mona Lisa. In all three paintings Leonardo used his famous “sfumato” or “smoky” technique to mimic how the human eye perceives subtle changes in color and light. Leonardo in Rome was experimenting with finer and finer glazes and varnishes which he used to layer again and again over the paint surface creating that sort of shimmering, mirage-like quality. And Leonardo, particularly in Rome, in his later years in Rome, was working almost like an alchemist on the preparation of these very subtle oils and varnishes. Indeed the pope Leo X. - the Medici pope who was there in Rome at the same time and who had rather a jaundiced or sceptical view of Leonardo - complained about the fact that he was always at work on his sort of chemical pots and pans producing these varnishes when he should be getting on with the painting where of course Leonardo would perhaps have replied: I am getting on with the painting because this is an essential part of the operation. Was the Mona Lisa also painted in this late period of artistic refinement? In the Mona Lisa - when he comes to do that – everything is working. Everything works: the veils, the transparency, the opaque pigments. He’s got it all under control. So this, begun probably in 1503, is a point of complete mastery after all the experimentation. We know for sure that at the end he finished the painting with the glaze technique. But we know also that he paint(ed) the Saint John the Baptist with the same technique quite in (at) the same time. So we can put the hypothesis he finished Mona Lisa in (at) the same time he made the Saint John the Baptist. The Mona Lisa from the Louvre consists of up to thirty superfine films of paint. With so many layers, the naked eye can no longer see individual brushstrokes. Is it possible Leonardo wanted to try his new technique on an old work he had abandoned long ago? Perhaps he saw the original as a failed experiment on canvas. Now he could recreate the alluring Florentine woman in all her magnificence, using his recent artistic advances. The similarities between the two portraits even go beyond the obvious. …when the scale is adjusted, the figures are exactly the same size, with identical proportions. The biggest difference between the two paintings is, in fact, not their appearance, but their condition. In contrast to her lookalike in the Louvre, the passage of time has left little trace on the Isleworth Mona Lisa. The unusual thing looking at this painting is the nearly perfect condition. You only have some tiny losses, minor retouches, no damages of the painting surface. On all pieces of art I worked on as a restorer or have done researches – they are looking completely different: much more damaged because of the time. So, my impression is, that this painting couldn’t be 500 years old. …until an art dealer stumbled across it – just when the Louvre Mona Lisa went missing. So it needs a lot of explanation to bring this painting into the direction being a Leonardo. The easier explanation, I think, is that it’s not done by Leonardo! Others maintain if Leonardo painted one Mona Lisa, he painted them both. The weight of the evidence is that it had to be done by the same artist with the same hand using the same technique. Some believe the Mona Lisa mystery has been solved. For others, there is still not enough evidence to say for certain. Even with the most sophisticated science it’s not easy to outwit a genius – whether prankster or prodigy. It seems the Mona Lisa may never divulge her secrets. There is now way today, no exam, no sets of exams, no single scientist, no group of scientists, that today will be able to identify the artist who made any work of art, including Leonardo.